Emily grew up in Michigan and started her life with horses in a somewhat unusual fashion. David and Linda Mastervich had no experience with horses when they decided to buy a pony for their 6 year old daughter. The result was a 4 year old pony that was transported home in the back of a van…needless to say much of what Emily learned in the beginning was by trial and error. Lessons started at age 8 at what happened to be an event facility. The real competitive drive started at age 10 when there were trophies to be won in 4-H. Emily started eventing at age 11 and credits Margaret Spencer with her solid foundation. She was able to build on that during clinics with Karen and David O’Connor and Jim Wofford. It was during her first summer stay at Woffords’ Fox Covert Farm in Upperville, VA that Emily came to the conclusion that she belonged in Virginia. Upon graduating she became a working student for the O’Connors. That helped her to venture out onto her own and she has been steadily building her experience and business since that time. Recent influences in her riding and training theories include Gerd Zeuther, Pierre Jolicouer, Jim Wofford, Kim Severson, Ralph Hill, and David O'Connor. Jeff was born and raised in central Kentucky. Growing up with a horse lover for a mother, Jeff showed an interest in horses at a young age and started foxhunting at age 12. After graduating from Duke University, Jeff went on to veterinary school at the Ohio State University. He began practicing in central Virginia where he met Emily while working on some of her horses. It was Emily that first got Jeff interested in eventing, and with her teaching (and patience), Jeff has progressed to the Intermediate level. Jeff, along with Keith Brady, opened Old Dominion Equine Associates in 2002 where he focuses on sport horse medicine. But thankfully he still makes time to fill all of his other roles including groom (which he won national honors for in 2007! ), exercise rider, cheerleader, and greatest dad on earth! 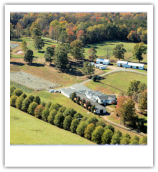 Brickland Farm is a full service family run farm catering to the needs of horses and riders that wish to specialize in any of the disciples that comprise the sport of Three-Day Eventing. Our goal is to provide individualized care and training regimes in order to achieve the best atmosphere in which to produce healthy and happy horses while we work to produce the goals that have been set forth. Horses and riders become members of our “family” and we all support each others’ efforts. From green to advanced there is a place for all to fit in.